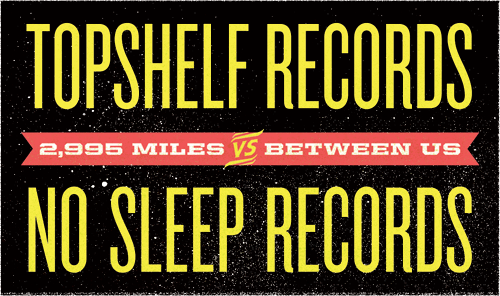 Topshelf and No Sleep Records have announced that they are planning to put out a compilation, entitled 2,995 Miles Between Us, and UTG has all of the details right here. This release will feature unreleased and rare songs from both labels’ bands and will drop on May 22. Please check out more information on this effort by looking below and let UTG know if you plan on picking this up! In addition to the 20 featured tracks, Topshelf vs No Sleep: 2,995 Miles Between Us will also include a code to download a bonus 50 song digital sampler. Also hidden amongst the releases will be “golden tickets” redeemable for various prizes, including No Sleep Records and Topshelf Records 2012 vinyl subscriptions, t-shirts, tickets, stickers and much more.